The church was founded in 1693, during the reign of William and Mary, and now in 2016 will be 323 years old. It has been at its present location in Charnwood Road since 7th May 1834 when the new chapel building was opened. We celebrate our Church Anniversary on the 2nd Sunday in May. 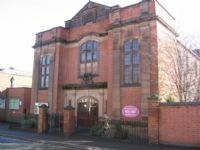 Charnwood Road Baptist Church has an interesting history and the following mentions some of the milestones in that history.There was no other Baptist Church for miles around. Shepshed was one of 3 or 4 places in Leicestershire which first took advantage of what was called the Act of Toleration passed in 1688 by William III. The county contains only three other Baptist churches that are older than the Charnwood­ Road church – Sutton-in-the-Elms, founded in 1650; Friar Lane, Leicester, 1665; and Arnsby, 1667. There was no Baptist Church at all in Loughborough till 1815. The Church dates back to the days when it required some courage to be a Non-Conformist. 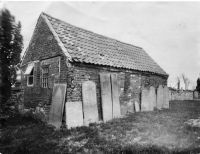 We should not be surprised to hear that although the Baptist Church was not formed until 1693 there had been Baptists worshipping in secret long before that in Shepshed and Rempstone - worshipping in surrounding woods, as did many other English Baptists in the days of persecution. Not till the Toleration Act of 1688 had been working for 5 years did they deem it safe to profess their faith openly. 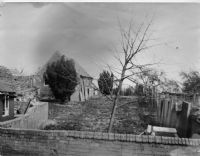 The Baptists in the Shepshed and Rempstone areas joined together in 1693 and for a time the community met for worship in the front parlour of one of the members, Mr Harris, in Antills Lane which became known as Meeting Lane. In 1705 there were 160 conformists and 50 dissenters and 200 families in village. 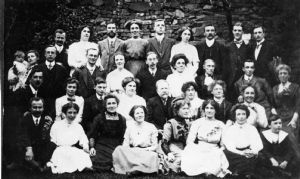 Click here for a list of the Pastors of Charnwood Road Baptist Church from 1693 to the present day, unfortunately we do not have any pictures of the first few ministers nor is there a lot known about them. In 1727 Mr William Christian of Markfield was invited to become co-pastor, because Rev Stretton lived so far away and a more regular ministry, with more pastoral care, was felt to be essential. Soon after this Rev Stretton moved to Foxton and Mr Christian became the sole pastor. At the time of his sudden death on 1st January 1765 the members of the church numbered 37. In April 1765 Rev. John Martin, of Kimboulton, Huntingdonshire, was asked to supply the pulpit “with a view” for a probationary period of 12 months following the sudden death of Rev W Christian. He received at the end of that time a definite call to the pastorate. In the following year it was found necessary to enlarge the Meeting House; the number of members then on the roll was 48. During the alterations, services were held in the “Presbyterian” Meeting House. It is unfortunate that no trace nor history of this place of worship can anywhere be found . Silence reigns over the years from 1767 to 1773 when Rev Martin resigned and left the neighbourhood. The church was not long without a pastor, for in the same year,1773, the Rev William Guy accepted the office. Here unfortunately, we have another long spell of quiet. However, in the following year on Thursday 17th October no less than 42 persons were baptised by Rev. Guy in the Meeting Yard, at Sheepshead, and added to the Church. As one of the preachers there observed - 42 persons baptised in 55 minutes!! In 1783, the church was once more without a minister, the Rev. William Guy having died after a pastorate extending over 10 years. In March 1784 Rev. Robert Mills received a request to serve the church for a year, “after which time a further union may be arranged.” The result of Rev Mills’ visit was a successful ministry that lasted for over 30 years. Rev Roberts, aged about 60, married Miss Ward, also of this village, in her 17th year. She possessed a fortune of £1000 with every accomplishment to make them happy. At Rev. Mills’ decease, in 1814, 276 members had been received into the church, Rev Mills himself receiving 130 of that number. During his 30 years of Ministry (1784-1814) three brothers, Joseph, William and Benjamin Christian became members of the church, all of them being subsequently elected to the office of deacon, holding that position for over 50 years. They travelled from Markfield for each service. We have a couple of photos but do not have any dates for them. Can you help? This was taken in the Manse garden but when? Do you know any of the people? 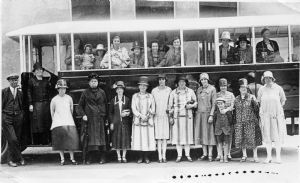 The following was taken on a ladies Outing but again we don't know when? We do however have some of the names of the folk on the photo! If you know any of the names we haven't got please contact us. We would love to hear from you.